Chisholm v. Georgia (1793) was a Supreme Court case which examined the issue of state and local sovereignty. 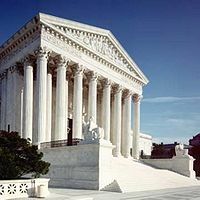 It is considered by many to be the first important Supreme Court case. In the court's ruling, it stated: The United States are sovereign as to all the powers of Government actually surrendered: each State in the Union is sovereign as to all the powers reserved. This page was last modified on 31 May 2018, at 21:14.